Visualizing your SuiteCRM geocoded data is now easy! You are now able to visualize behavior patterns in your data you might not have otherwise observed. Map visualizations gives you a whole new level of location specific contextual insights that would not have been possible with just tables and charts. This is especially helpful for data analysts and product teams who often work with location based data, in industry verticals such as logistics, real estate, hospitality, transportation, ecommerce and more. 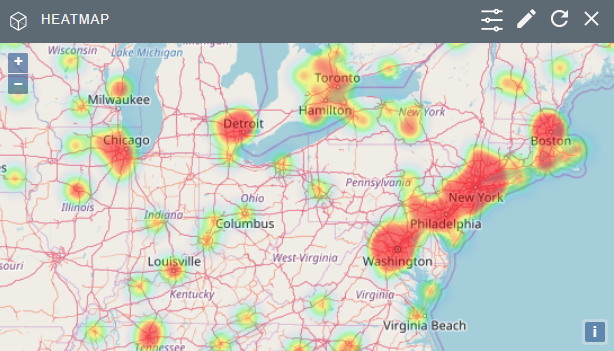 Ability to build your own heatmaps using different configuration options (Radius, Blur, Opacity) and see the results on the fly. With this smart dashlet you can built your geo heatmap to enable you to take control of your data and empower your business for growth!